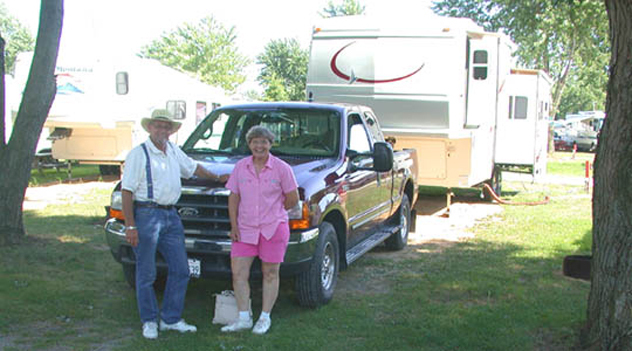 Fred and Verna Fluke headquarter in Auburn, California and are very experienced fifthwheelers. They previously owned a very nice, custom built Automate. Their previous fifthwheel was in such nice condition that the first person answering their ad bought it. Fred and Verna wanted a new quality 4 seasons fifthwheel with the Americana model independent suspension, 16" wheels and most of all the new, state of the art hydraulic disc brakes. Installed in the Americana RT Model. Americana won as their final choice and, according to Fred, a $10,000 to $15,000 better factory order price advantage over the "good competition" helped make the their final ordering decision. After the Flukes where checked out in their new Americana GS30/31RL model at our Elkhart, Indiana service center near the factory, they hooked up at the Elkhart Campground for an overnight check of all the systems. We really don't want our customers to "hit the road" until we are sure that "Murphy" (wrote all those laws) hasn't been up to his old tricks.Our service center is at hand to make any corrections which may be necessary. Set up at the campground, our Jerry Lemar, (So. California Americana model fifthwheel specialist), is leaning on Fred's short-bed Ford. Verna has a big smile on her face, as she now feels more secure while traveling the Western Mountains with her new powerful and smooth Americana Hydraulic 12" disc brakes and the very nice 16" Aluminum 6 lug wheels. 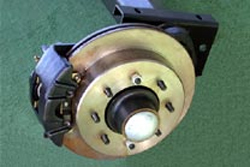 The lighter weight brake system aids the ride quality. Simple disc brakes are low maintenance. New Americana, cool running, smooth and powerful hydraulic disc brakes, installed on 5200 lb. axles. 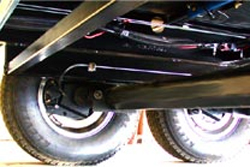 Our tough independent suspension system is pictured attached to the HD 16" steel carry through web section chassis. The big tube axles are solid and don't move. The trailing arms and spindles handle all the suspension action. The suspension is self dampening. No need for shocks!! We also offer a fully self-adjusting air-ride suspension upgrade option.